From Traidcraft - Fighting Poverty Through Trade. From Alara Wholefoods, Camley Street, Kings Cross, London. A simple granola, oats toasted with sugar and honey, raisins, sultanas and sunflower seeds. A creamy gentle porridge, filled with wholegrain millet & buckwheat. From Alara Foods, Islington, London. 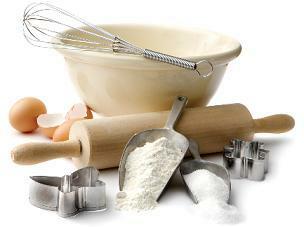 Over the past three years Britain has seen a great surge in home baking. Partly thanks to the Great British Bake Off which has transformed Britain’s view on baking and made it trendy again! In support of this, we now have a section dedicated to all the goodies you should need to get elbow deep in dough and batter to create your own tasty bakes! Along with the pantry essentials, we will provide you each week with new seasonal produce to bake with and recipes to get some baking inspiration! From Gran Stead's Ginger Co., Sussex. A unique 50 / 50 blend of durum wheat & strong white flours - perfect for authentic Italian pizza & pasta. From J Wilkin & Son, of Tiptree Farm, Essex. 'Grown-up' strawberry jam with a rich, mature flavour. A great pairing of fruits, making a dark berry jam.